Trivia Cubes are changing the way people play. 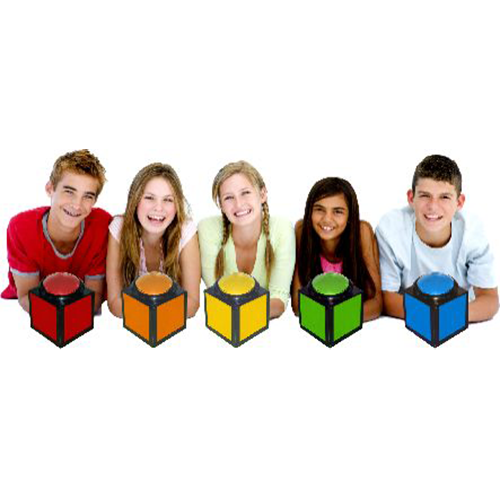 With no monthly fee or internet needed, Trivia Cubes are the perfect addition to any party. It’s like your own mobile TV game show, only with much more customization! 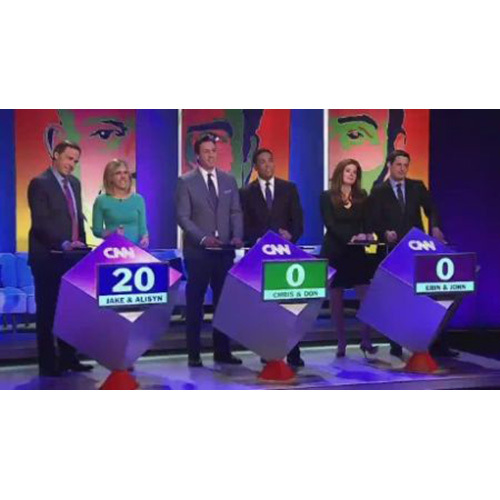 Trivia Cubes are the easiest and most professional way to bring the excitement of TV game shows to your events. Our wireless buzzers connect perfectly with our games, delivering a thrill that can’t be matched by tabletop or cell phone gaming. You will love our TV-game show style lockout feature: The first contestant to buzz in locks out the other players and light up just like on a real TV game show. 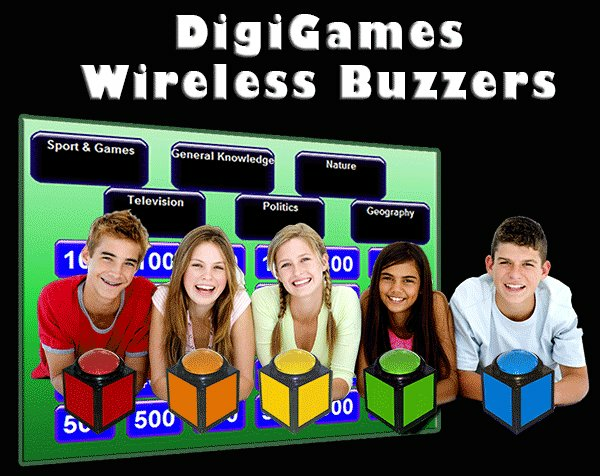 Order as few as 2 wireless buzzers for 2 teams head to head, or as many as 50 buzzers, for 50 simultaneous trivia players! Trivia Cubes (Model TM-120CC) - Player buzzer lights up. Trivia Cubes PRO (Model TM-120CCP) - Entire unit lights up, not just the player buzzer. Generally $10 more per cube. EXTREME Cubes (Model TM-125) - Player buzzer lights up, entire unit lights up, also has ABCD keypad for multiple choice question and answer sessions. Generally $30 more per cube. 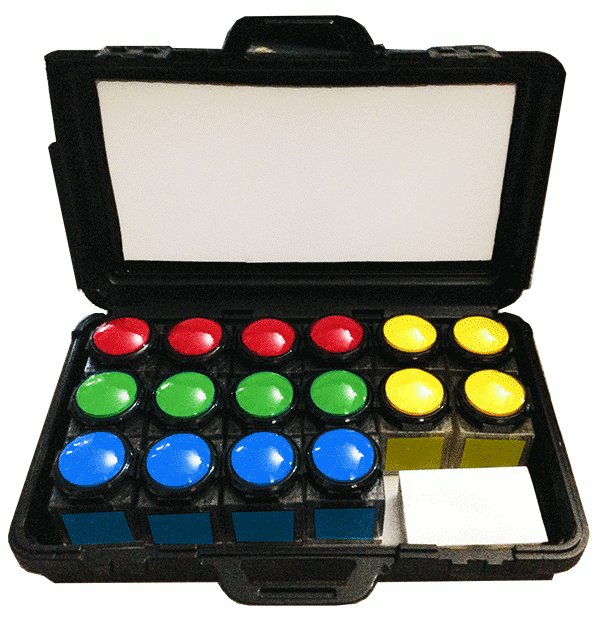 Trivia Cubes Stand-Alone (Model TM-120SA) - Click here to view our computer independent wireless buzzers, remote controlled. What Makes our Wireless Trivia Buzzers Unique? Trivia Cubes are available in a variety of exciting colors that are sure to catch the eye. From the feel of the buzzer button to the look of the buzzer box, every last effort has been painstakingly taken to ensure that this is the closest you’ll come to playing in a real TV studio! Trivia Cubes are easy to setup and maintain. Who wants to spend the night unraveling cords and hooking up wires? With Trivia Cubes, you’ll be ready to play in a matter of moments. These wireless buzzers are money making machines! Not only do entertainers around the world secure new accounts with them but are also able to re-establish accounts from past clients. They are slowly pushing pen-and-paper trivia hosts out the door. No one can cheat! Unlike pen and paper trivia, it isn't possible to cheat. By the time a player would find the answer on the internet they will have missed the next 5 questions! At least 4 software games included with your Wireless Buzzers purchase! See the "What's Included" tab above. Databases of add-on questions and answers are available to help make your trivia experience fun, challenging and unique every time you play! A growing catalog of different style games and different formats built into each software game will ensure that each event you do is fresh and unique to your players. It is unlikely your players will want to participate in 4 hours of Jeopardy style trivia. 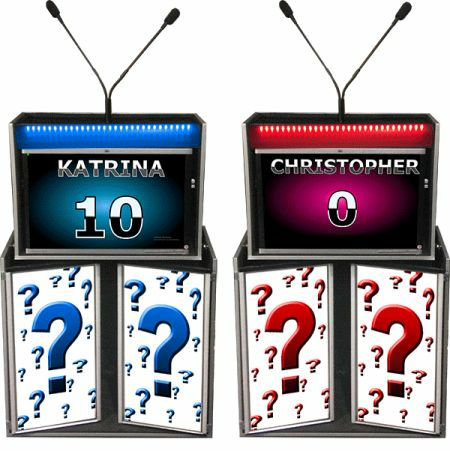 Our software also allows you to do many other TV-Style game shows so that each round of trivia you do can be a fun and exciting fast-paced unique TV game show. Our Trivia Cubes come with 1,000 questions to get any party started right out of the box. Not only are additional questions available, but you can even use our software editor to create your own custom trivia games! Throwing a Anniversary party? Fill your night with questions about the anniversary couple. Hosting a bridal trivia session? Pit bridesmaids against the groomsmen or in-laws against in-laws for a fun bridal trivia or Family Feud style game show. Hosting a Super Bowl party? Instead of watching boring tailgate coverage, why not quiz everyone on their knowledge of your favorite sports team? 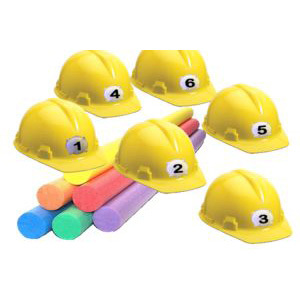 The possibilities for custom trivia games are virtually endless. 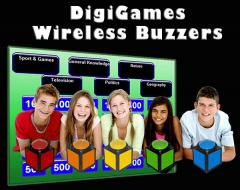 YOUR WIRELESS BUZZER PURCHASE INCLUDES TV-STYLE SOFTWARE GAMES! 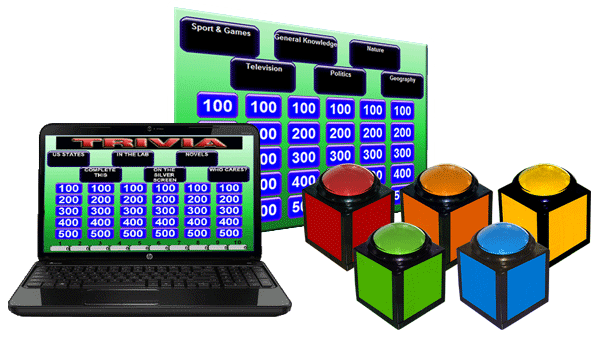 Trivia Board Pro 4 (similar to Jeopardy on TV) is the perfect software tool to create your very own custom trivia games. 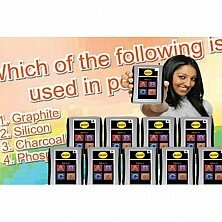 This software program can handle text-based questions, video clips, audio clips and pictures, meaning that you can create a unique, interesting trivia game that will leave a lasting impression. Trivia Feud (similar to Family Feud on TV) is perfect for corporate events where different departments go head to head in a challenge to solve surveyed answers. Kids love it too for guys against gals trivia. Planning a wedding rehearsal dinner? Get in-laws against in-laws in this action packed game. 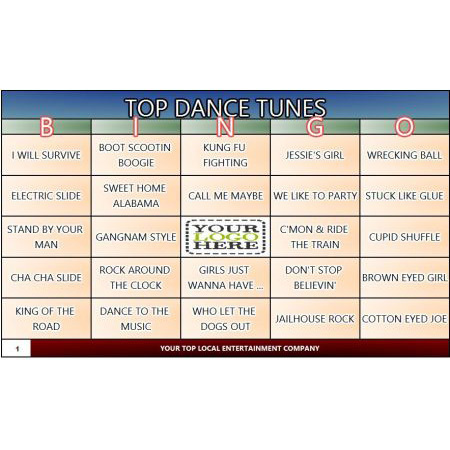 Trivia Squares (similar to Hollywood Squares on TV) is perfect for any event where smarts, luck and strategy force players to play offensively and defensively in a trivia based tic-tac-toe game. Trivia Fortune (similar to Wheel of Fortune on TV) is perfect for youths, grandmas and grandpas and anyone in between. Originally based on the concept of "Hangman" players press their buzzer to stop the "wheel" and then earn points by picking letters in a hidden phrase. Our "wheel" is based on the TV show "Press Your Luck" but instead of Whammies, players need to avoid "Bankrupt" and "Lose a Turn". Our wireless buzzers are perfect for any situation, including competition games or team play games. In "Competition Play" mode all players are competing against each other to get the highest score. In "Team Play" mode, you don't want to know what player had the highest score.... you want to know what TEAM had the highest score. This involves using multiple buzzers for each team, and most of our software games support team-style games. For example, if you have 10 buzzers you can give 5 to the bridesmaids and 5 to the groomsmen for a round of "Bridal Trivia". You don't need to know which person had the highest score. In this example you need to know who won.... the bridesmaids or the groomsmen. Our software games support "grouping" buzzers into teams so that you can easily do Bridal Trivia games. Other uses of "Team Play" include having management against employees for corporate events, students against teachers at school fundraisers, guys against gals for Battle of the Sexes games, and much more! With Trivia Cubes, you hold the power to transform any event into a memorable and unique experience. Bring home the excitement of TV game shows today! All DigiGames products include a 1 year full warranty. 1. Launch any one of DigiGames software games and ask your questions (use factory default questions or add your own questions and answers into the game). Participants 'buzz in' with their answers by pressing on the Trivia Cube. 2. The participant to buzz in first will see their wireless buzzer light up, signaling that he or she has the 'go-ahead' to answer the question. All other participant buzzers do not light up to signify that their buzzers are deactivated. Identification of which contestant was first also appear in the software. HINT: Connect a projector to your laptop for a greater game show experience. 3. If a contestant answer is wrong: Press 'NO' in the software. Other contestants now have the opportunity to answer. If a contestant answer is correct: Press 'YES' in the software. All the buzzers will release and a new question session can begin. Made from durable ABS plastic with colored sides - ideal for extreme abuse applications. 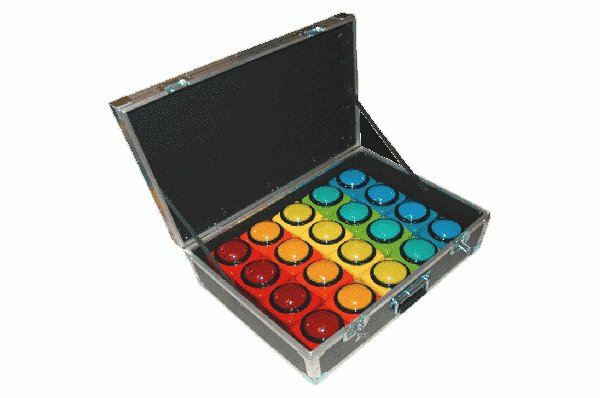 Combine together as many as 50 computer controlled trivia quiz buzzers. Each unit measures 4 inches cubed, 6 inches tall (10cm x 10cm x 12cm). Easy to set up and transport. Out of the box with a 500’ (150 Meters) or greater range. Each Trivia Cube uses a 9v battery (included) and lasts for 60 consecutive hours or 20 trivia events. Schools/Academics - Use for classroom training, student participation and team building, post-prom parties, fundraisers, and other after-school activities. Trivia Cubes are perfect for increasing student's test scores by using test questions as part of a trivia game prior to the test. We pride ourselves on providing turn-key gaming systems that are "out of the box, ready to go!" with no hassle. You could do your first show the same day you receive your package! Although we recommend being familiar with your system before any paying trivia job. The quantity of buzzers you order (as specified above). Software Licensing for 2 or 3 computers (additional keys can be purchased on this site). Unlimited phone and email support for life. Free software updates for life. 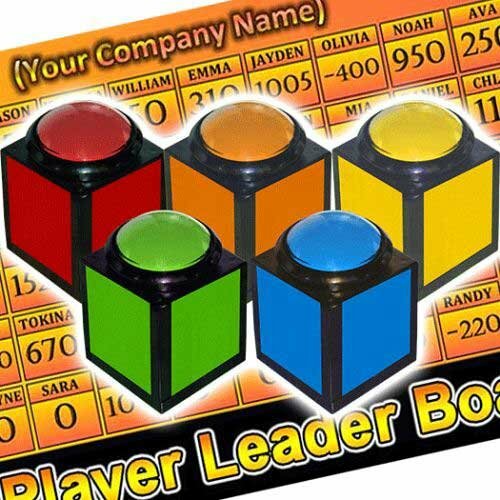 Purchase of 5+ Trivia Cubes, Trivia Cubes PRO or Extreme Cubes includes a USB receiver, batteries, and the "Trivia Party Pack" for 2 computers (Trivia Board Pro 4, Trivia Squares, Trivia Feud and Trivia Fortune). Purchase of 10 + Extreme Cubes includes a USB receiver, batteries, and the "Trivia Party Pack" for 2 computers (Trivia Board Pro 4, Trivia Squares, Trivia Feud and Trivia Fortune) and Trivia Ladder Pro. 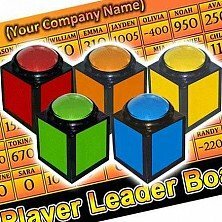 Purchase of 20+ Trivia Cubes or Trivia Cubes PRO includes the USB receiver, batteries, and the "Trivia Party Pack" (Trivia Board Pro 4, Trivia Squares, Trivia Feud and Trivia Fortune), QuizMaster, and Trivia Ladder PRO for 3 computers. Purchase of 20+ Extreme Cubes includes the USB receiver, batteries, and the "Trivia Party Pack" (Trivia Board Pro 4, Trivia Squares, Trivia Feud and Trivia Fortune), Extreme Quiz Lite, Talent Hunt, and Trivia Ladder PRO for 3 computers. 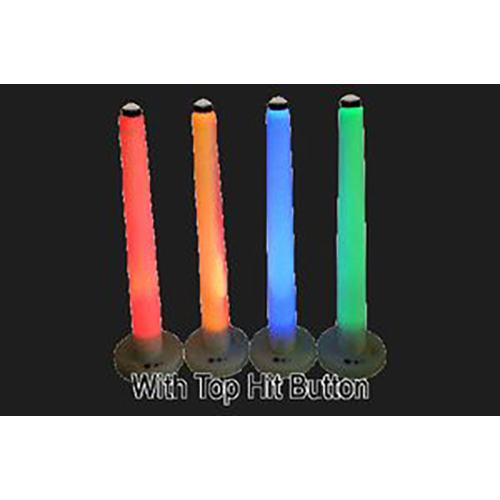 * Included with purchase of 5 buzzers or more. This is a Computer Controlled product which works with our software games (SOFTWARE GAMES INCLUDED!). Click here for our stand-alone wireless buzzer version.